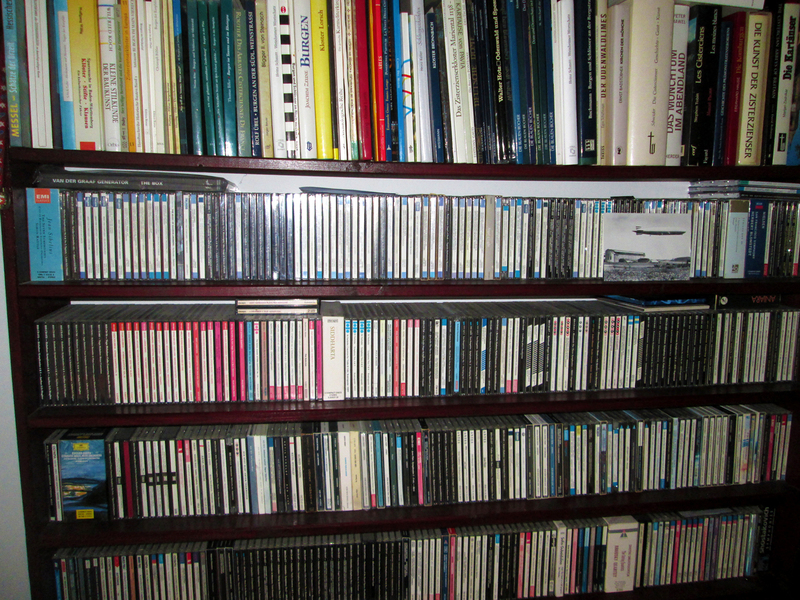 I know you from your interest on progressive music, but there’s a huge section of classical CDs. Do you have this kind of background? What is the Siddartha Box I see? 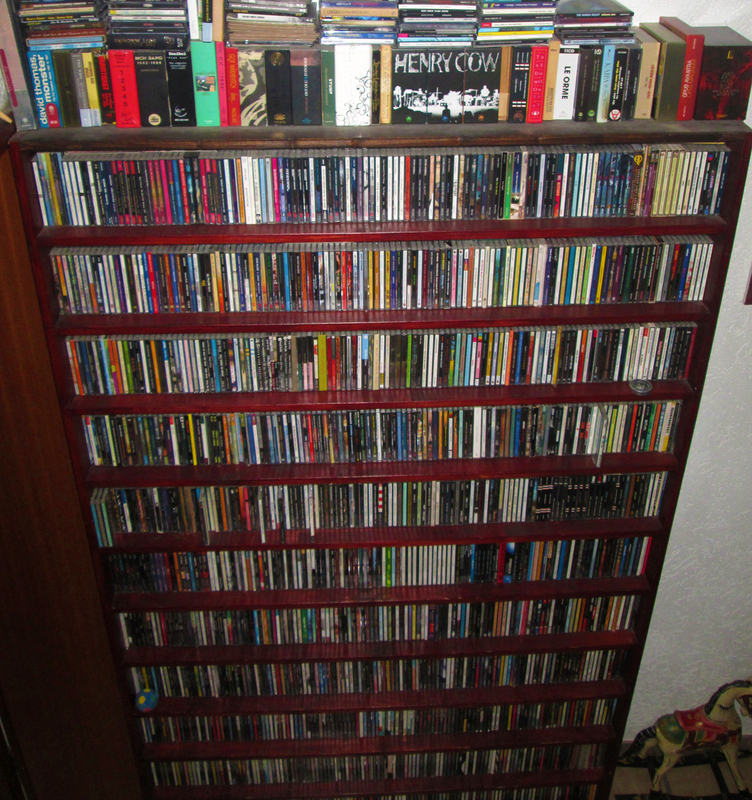 I indeed also have quite an extensive collection of classical music, mostly ‘modern’ music, written in the 20th or 21st century, but also from late 19th century romantic composers. I actually started my more serious musical explorations with classical music (I did the usual taping of songs I liked from the radio – mostly 70s Pop/Rock-Music – before that) in the early 80s. The first LPs I bought myself back then contained recordings of works by Antonín Dvořák (the symphony “From the New World”), Edward Grieg (including the “Peer Gynt” suites), Modest Mussorgsky “Pictures at an Exhibition”, and of orchestral works by Maurice Ravel. This started with a tape I had with an audio drama of “The Last of the Mohicans” by James Fenimore Cooper, and they used “From the New World” as background music. Thus, I got curious what that was, and so I asked my father, who could identify the music. Then, I got the LP (with Karajan conducting the BPO). Around the same time, we had a class in school on Musical Adaptations, and we listened to “Pictures at an Exhibition” by Mussorgsky, Ravel, Tomita and Emerson Lake and Palmer. That’s how I learned of progressive rock, and ELPs “Pictures at an Exhibition” was then my first LP with such music, and another starting point for explorations. I went on looking for progressive or a bit more experimental music in many genres, including classical music. “Siddharta” is an opera by the Danish composer Per Norgard (I am quite fond of Scandinavian classical music). I like his orchestral music (symphonies and concertos), and gave it a try with this opera. I think I heard it once. But the box also includes his 1st Percussion Concerto, which is quite great. In general, I have huge problems with operas, or music with too expressive singing. 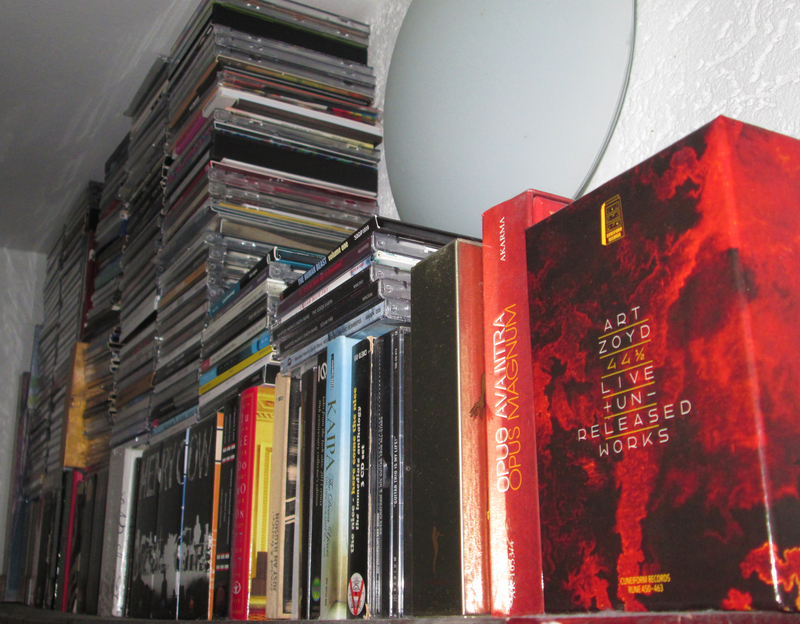 But, from time to time, with composers I like, I pick one up. But so far, I am not confortable with the genre at all. “Bluebeard’s Castle” by Béla Bartók is fine, though, or “Aniara” by Karl-Birger Blomdahl (first Science Fiction opera). But generally I avoid operas and music with too much singing. Order… well, there is some kind of order. I started putting the CDs ordered by country. With composers this is pretty unambiguous, and mostly also a band can be allocated to a country. At some point the shelves were full (I made these myself, by the way), and I started putting CDs on top or wherever there was some space. Thus, now it is partly pretty mixed up. But mostly, I find the CD I am looking for rather fast. To re-order this (alphabetically maybe) would take some time. And I would need more shelves. The boxes are up there, because they fit there best. I have most albums by The Ex. At some point in the past I heard a lot of punk and new wave stuff (and related more experimental music like This Heat), and The Ex was one of the bands I discovered. I have seen them live once in Mannheim (early 90s), without Tom Cora (their CDs with him are great). That was quite a weird concert, with Terrie Hassel ripping of the strings of his guitar, and using these to create noise winding them around the guitar neck. And they had (have?) a cool female drummer. Decibel is a Mexican RIO-like band, stylistically related to Henry Cow. They exist since the middle of the 70s, and this box collects most of their historic recordings. They are still around and active, and have released a new album in 2017. Mexico has a small but pretty great avant-rock scene, with bands and musicians like e.g. Arteria, Culto Sin Nombre, La Musica de Erich Zann Nazca, Via Lactea, Erehia, José Luis Fernández Ledesma and Cabezas De Cera. Members often overlap, thus there is rather a small group of people involved. MCH Band is Mikoláš Chadimas band from the Czech Republic. They are also around since some time (early 80s), and play a kind of progressive alternative rock. This box contains all their albums from the 80s. There are (have been) some great (but rather unknown) Czech progbands, especially in the 90s, e.g. Aku-Aku, Dunaj, Domácí Kapela, Narajama, Hokr, Pluto, Slede, Zivé Slede or Uz Jsme Doma. Art Bears were Fred Frith, Chris Cutler and Dagmar Krause, a follow up band to Henry Cow. This box collects all their recordings (on Recommended Records). They were only active for a few years around 1980. RIO-Avant-Pop. Great stuff! Magical Power Mako (Makoto Kurita) is a Japanese electronics/prog/avant weirdo. He usually does everything alone in his home studio, and has released quite a few strange records since the early 70s with some kind of krautrock-spacrock-psychedeic elaborations. This box (released in 2004) contains some 5 hours of music he recorded between 1972-75 that remained unreleased back then. Weird stuff! I am very fascinated by the presence of puppets and similar… what is the frog for? and the crocodile and elephant? These are puppets or toys from my kids. They grow up (now 11 and 14), and sometimes they feel they are to old for some of these. Thus, instead of putting them in a box in the basement, my wife and I put them somewhere in our house, including the CD shelves. Thus, no special meaning… just decoration connected to family history. What is that postcard with the zeppelin, and the “arigato” message? My son visited the Zeppelin museum at Lake Constance once with my parents. He brought back this card, and gave it to me. I am also interested in technical things from the past (and history in general). Thus, I put it there into the shelve. I ordered a CD directly from a seller in Japan (I think it was a Conrad Schnitzler CD on Captain Trip – a Japanese Label that also reissues Krautrock), and this ‘thank you’ message was in the package. I though this looks nice, and put it there into the shelve. How the hell you managed to take those pictures from above? You have to climb a chair a suppose to get the CDs on the upper shelves, right? There is a very simple explanation. 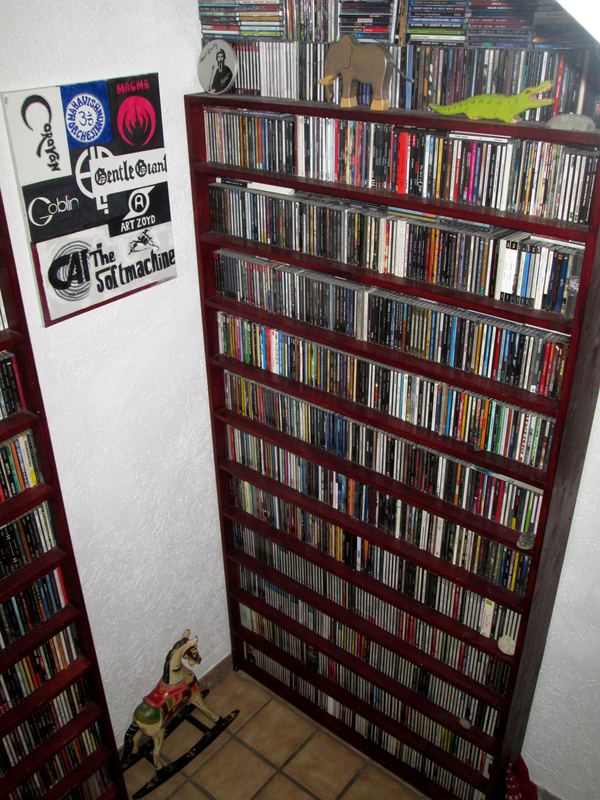 Our house has many floors, and these CD shelves are placed in the staircase. I just stood in the next level, and made the photo versus downstairs. 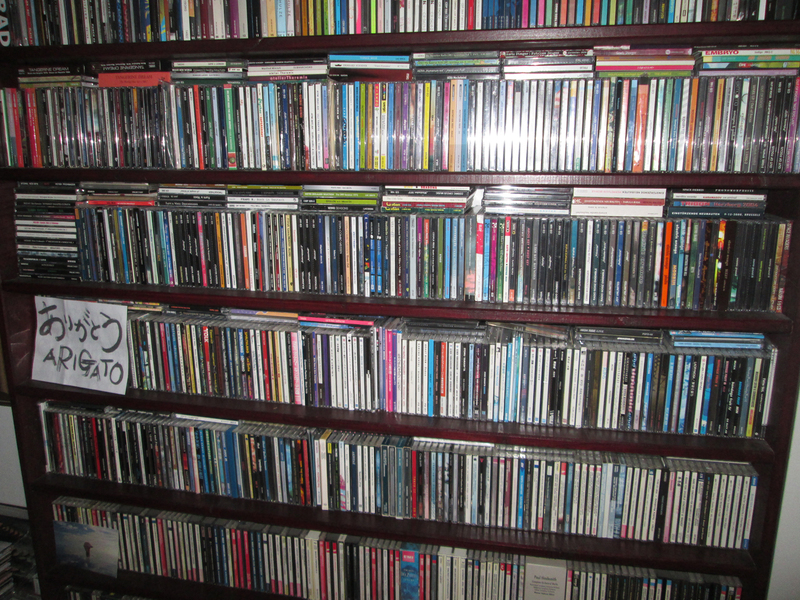 Further, I am rather tall, thus I do not need any device to reach the CDs. 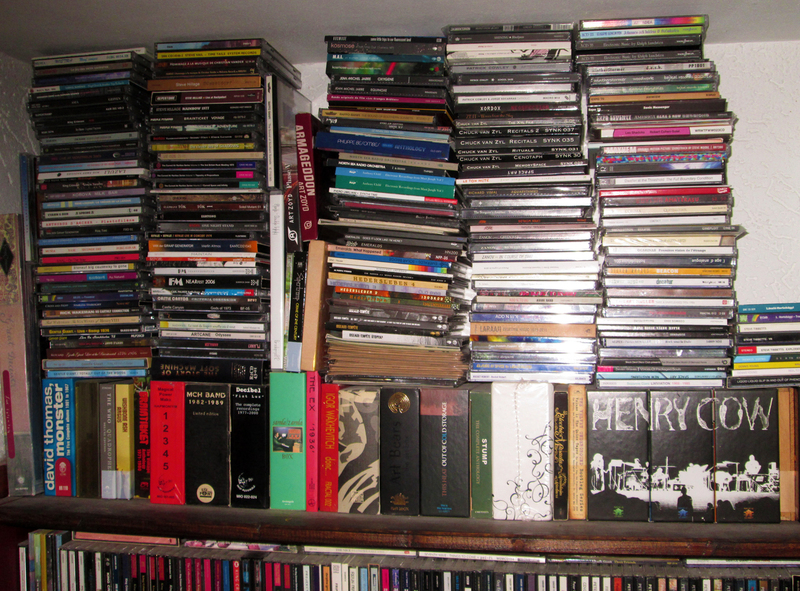 Just, when I can’t find a CD, and need to go through them in more detail, I might use a chair. Maybe only a question on your activity as writer/musical journalist. When did this start, and how did you get to BabyBlaue, one of the most incredible webzine I know? It started when I was a year or so in Milan, and felt alone in the big city. I was browsing the Internet, and found that rather new site. This must have been around 1999 (I came to Milan in 1998). I read the reviews there, and followed the site for some time. At one point, I though I could write reviews and asked Udo (the guy who started all this) to join. Actually, I was already writing reviews back then, that were published on the GEPR site. That site is dead since many years now. I started writing, because I felt that I know things (bands, LPs etc.) that other people do not, and that I could contribute to share this information. At that time, the net was not that large as today (no Wikipedia etc. ), and it was difficult to find infos on obscure LPs. Thus, I thought I provide these myself. Udo liked my sample reviews, and I started. I think my first review was this one of Godspeed You! Black Emperor’s “f#a#oo”. Nice to hear the story of your involvement with Baby Blaue! I don’t think that it’ll cost so much, but it’s true that the content is a lot, and that the design is old fashioned… but it works. My opinion is that sites like that (I wrote for a similar one in Italy called Sound and Silence) are those followed maybe not by thousands of people, but by the ‘good ones’, those that don’t stop to online streaming, but get deeper in buying actual CDs or LPs. There are many other strange and interesting things in the photos… can you tell me about the theremin? I saw Pere Ubu in Weinheim about 10 years ago, and they had a guy (Robert Wheeler) that used quite extensively a Theremin on stage. I was pretty much impressed. Thus, when some years ago Moog issues the Theremini (a kind of simpler version of their Theremin, which comes with a lot of effects and different sounds), I picked one up. It’s fun to play with it, and one can create pretty cool noises (even if you can’t actually play it – notes and melodies I mean). Behind it you see a part of my LP collection. I started with LPs back in the 80s of course, being quite reluctant to go for CDs when they came up. All my friends where laughing, and told me how much better CDs sound. But, most of the stuff I was looking for was not available on CD back then (Krautrock and Prog), but still easily available on LP (specially on LP fairs). In the 90s, I switched to CDs, too. 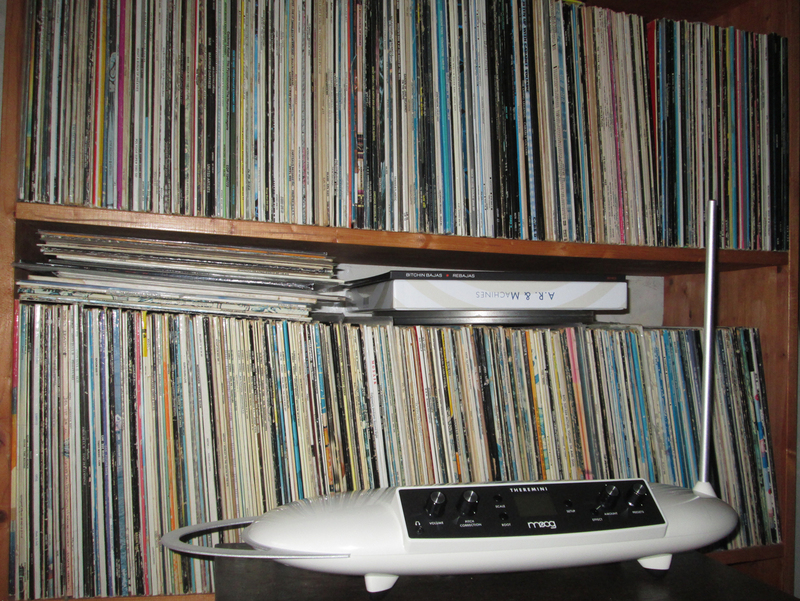 And now my friends tell me, how cool LPs actually are, and how better they sound. And what is that frame with the band logos inside? This was a Christmas present of my daughter. One day she asked me about the names of some of my favorite bands. Then she gave me this as a present, using the logos she found on the Net. It’s pretty well done and nice. And, it triggered her interest. I also saw her digging around my LPs (she thinks are old fashioned hence cool). So far, she just likes to put the covers on the wall of her room, but maybe, I found an heir. Achim Breiling was born in 1968 in Baden, a small town in northern Switzerland, to German parents. After a few years the family moved back to Germany, finally settling again where they came from, to Weinheim, a town in southwest Germany, not far from Heidelberg and Mannheim, where Achim spent his youth. After studying molecular biology in Heidelberg, he went for nearly 10 years to Italy, working in cancer research at institutes in Milan and Naples. Since 2007 he is back in Heidelberg, now working as editor for a scientific journal. Since his early youth sounds are an important part of his life, and he developed a keen interest in anything that can be called music in a broader sense. He spends a lot of his time discovering new and old sounds, in particular recordings of these, mostly in a vague rock context, and telling people about his discoveries.